Maddy is allergic to the world; stepping outside the sterile sanctuary of her home could kill her. But then Olly moves in next door. And just like that, Maddy realizes there's more to life than just being alive. You only get one chance at first love. And Maddy is ready to risk everything, everything to see where it leads. And don't miss Nicola Yoon's #1 New York Times bestseller The Sun Is Also a Star, in which two teens are brought together just when the universe is sending them in opposite directions. Madeline has never left the house in all of her seventeen years. When Olly moves in next door, and wants to talk to Maddie, tiny holes start to appear in the protective bubble her mother has built around her. 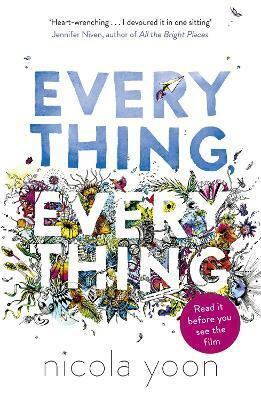 Perfect for fans of THE FAULT IN OUR STARS by John Green, EVERYTHING, EVERYTHING is about the thrill and heartbreak that happens when we break out of our shell to do crazy things for love. Nicola Yoon is the number one New York Times bestselling author of Everything, Everything. She grew up in Jamaica and Brooklyn and currently lives in Los Angeles with her husband and daughter. She's also a hopeless romantic who firmly believes that you can fall in love in an instant and that it can last forever. Follow Nicola Yoon on Instagram and Tumblr and @NicolaYoon on Twitter.